Dry pastures in Western Australia provide good early feed after senescence but rapidly become unable to maintain stock. Stubbles are the major feed source for sheep during the summer-autumn period. While there is often up to three tonnes of dry plant material per hectare available, sheep grazing stubbles eat only about 6% of it. With increased harvesting efficiency and better weed control, stubble paddocks now generally contain less grain and fewer weeds than in the past. Feed budgeting in the dry period is inherently difficult due to the variability of the quality of dry feed and the value of the subsequent portion that the sheep choose to eat. 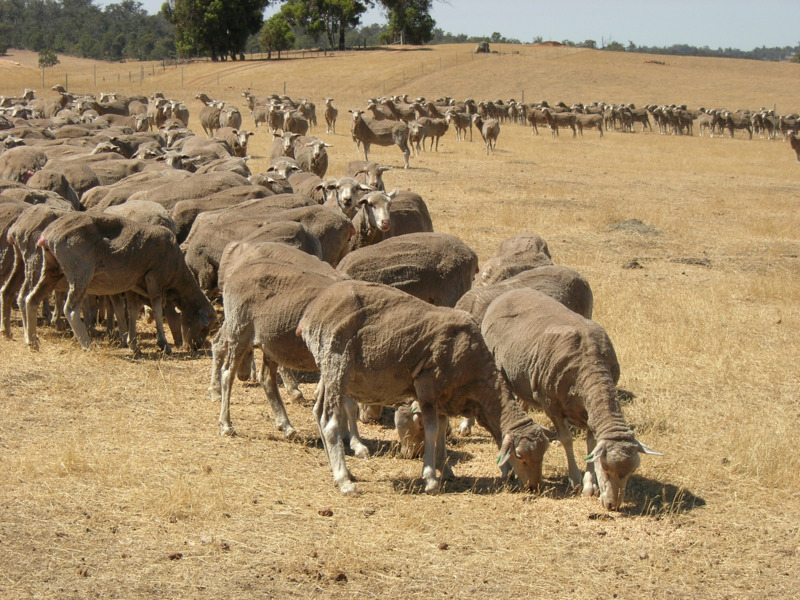 The decline rate, pasture height differences between different pasture systems and the amount of grain available in stubbles also affect the amount of energy sheep can gain from grazing dry residues. The dry residues of annual pastures like subclover, medic and serradella, along with weeds such as ryegrass and capeweed, usually have a digestibility of about 55% at the start of summer. This level can vary considerably and will decline over time, especially after hot weather and rainfall that damages the finer leaf fraction of the pasture. Most of the decline from above 70% to below 50% happens in three to six weeks, with hotter weather causing a quicker decline than cool weather. The amount of feed that can be eaten by a sheep on a daily basis is related to the digestibility of the feed (often called quality). The lower the digestibility, the lower the feed intake by the sheep. Dry feed with a digestibility below 55% – approximately 8 megajoules per kilogram (MJ/kg) – will, at best, only maintain liveweight regardless of the feed on offer level as the sheep can’t eat more than one kilogram on a daily basis. For young sheep, a dry annual pasture with about 50% legume content can only provide growth rates of one to two kilograms per head, per month for one to two months. This is because it is only slightly above a maintenance ration. It is recommended that sheep are regularly assessed for condition score over the season to ‘let the sheep do the talking’ on how much and what quality of feed is being eaten.